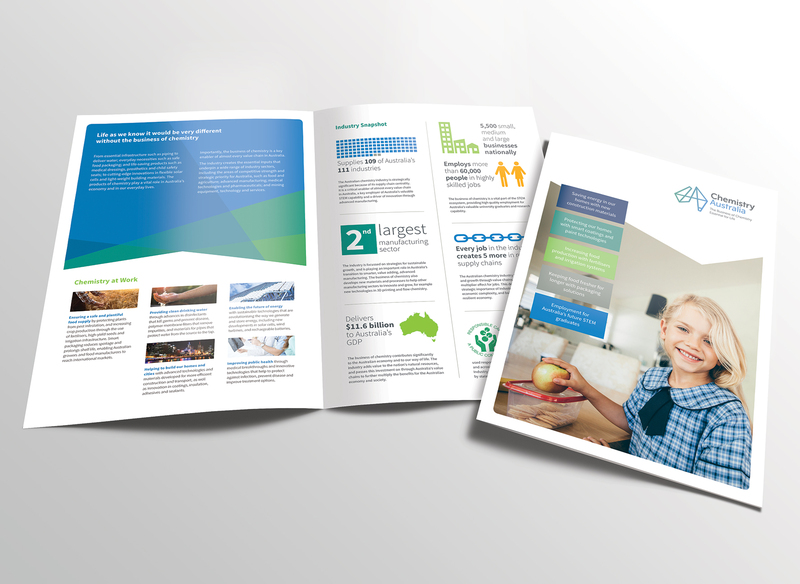 We recently finalised our designs for the newly branded and renamed Chemistry Australia, the national peak body representing members of the Australian chemistry industry. The new visual brand and name are both bold departures for the organisation. Formerly known as The Plastics and Chemicals Industries Association (PACIA), the new name seeks to go beyond negative consumer perceptions of traditional plastics and chemicals to better reflect the diversity and expertise of industry members. This is not just aspirational branding: through innovative technologies and products industry members strive to find more sustainable ways of creating the things we depend on for our way of life, such as energy saving materials and healthcare components. Fenton started by testing staff and external stakeholder perceptions to the old PACIA brand. This research gave us input on the most suitable approaches for a new brandmark. Where possible we like to involve staff in the design process (in our experience everyone enjoys playing designer for a day). We then presented a selection of familiar brands to establish some conceptual and stylistic reference points. These reference points often help people feel more confident making design choices and distinguishing between personal preferences and what’s right for the brand. Our first decision was to rule out stereotypical representations of chemistry such as beakers, test tubes and the periodic table as our task was to represent the business of chemistry not the learning or scientific aspects of chemistry. This lead us to use elements such as interconnecting lines, a map of Australia, federation star, polar covalent bond and the letters C and A. The linear elements making up the map of Australia have a subtle ‘folded’ dimension to them representing connectivity and the letters C and A. The logo was given rounded edges to soften the angles and add personality. New brands typically need a bit of time to prove themselves and for everyone to feel confident once the honeymoon period is over. So far feedback from staff and stakeholders has been very positive.